One of the biggest success stories on public television and a huge international hit returns for its newest season with Doc Martin Series 6 debuting on DVD on December 10, 2013 from Acorn, an RLJ Entertainment, Inc. (NASDAQ: RLJE) brand. 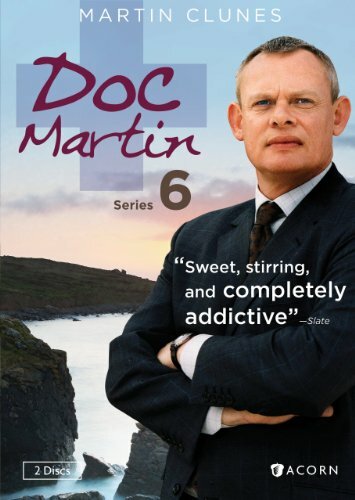 Doc Martin is the #1 show for many public TV stations, and the previous season was Acorn's top-selling DVD of 2012. In the U.K., Doc Martin is ITV's highest-rated drama series with more than 10 million viewers, and the series has been licensed in more than 70 countries with amusing localized versions. Fan favorite Martin Clunes (Men Behaving Badly) is back as the surly, self-centered Dr. Martin Ellingham. In the sixth series, the doctor tackles fatherhood, his complicated relationship with local teacher Louisa (Caroline Catz, Murder in Suburbia), and the return of his mother (Claire Bloom, Brideshead Revisited). The series co-stars Emmy(R) winner Eileen Atkins (Cranford, co-creator of Upstairs, Downstairs), Ian McNeice (Doctor Who) and Joe Absolom (Hatfields & McCoys). The DVD 2-disc set includes eight episodes, plus 64-minutes of behind-the-scenes segments ($39.99, AcornOnline.com). Series 6 aired in the U.K. on ITV in Sept. 2013, and Acorn.TV streamed the exclusive U.S. premiere in Oct. 2013. Through American Public Television, Series 6 will begin airing on public television in February 2014. Even on his own wedding day, Dr. Martin Ellingham (Martin Clunes) is all scowls. Then following a calamitous honeymoon, he and Louisa (Caroline Catz) must learn to live together, raise a child, and manage two careers. It's a big adjustment for both, especially Martin, who's unaccustomed to clutter and noise. And yet he's still not as picky as their OCD nanny. Factor in the Doc's usual string of batty patients--including a hypochondriac, a hoarder, two elderly tattoo artists, and a bumbling constable with a string of self-inflicted injuries--and Martin is soon more ill-tempered than ever. Plus, his crippling blood phobia is back, and his ghastly mother (Claire Bloom) picks a bad time to show up at the Ellinghams' door. With much at stake, Martin turns for advice to his aunt Ruth (Eileen Atkins) perhaps the sanest person in Portwenn--but it may already be too late. ACORN TV: "Best British TV" streaming service Acorn TV is now streaming the exclusive U.S. premieres of four hugely popular UK series - MIDSOMER MURDERS Set 23, DOC MARTIN Series 6, Lynda La Plante's ABOVE SUSPICION Set 3 starring Kelly Reilly and Ciaran Hinds, and Vera Set 3 starring two-time Oscar(R)-nominee Brenda Blethyn; as well as, Helen Mirren's PRIME SUSPECT; Jeremy Irons's BRIDESHEAD REVISITED; and a riveting thriller from the creator of Foyle's War with INJUSTICE starring James Purefoy (The Following). Complete press access is readily available upon request. At www.Acorn.TV, Acorn TV streams more than 80 series. An RLJ Entertainment, Inc. brand (NASDAQ: RLJE), Acorn specializes in the best of British television on DVD/Blu-ray. 2013 releases include: Jack Irish starring Guy Pearce, BBC's The Syndicate, The Fall starring Gillian Anderson, Miss Fisher's Murder Mysteries, Doc Martin Special Collection, Helen Mirren's Prime Suspect and Smiley's People on Blu-ray, star-studded Tales of the City: 20th Anniversary Edition, and more episodes from George Gently, New Tricks, Murdoch Mysteries, and Vera.